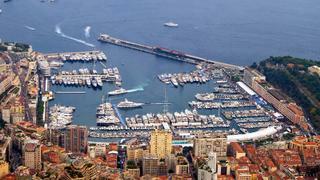 The prolific Monaco Yacht Show kicks off on September 27 and the superyachts are flocking to be part of the big event. 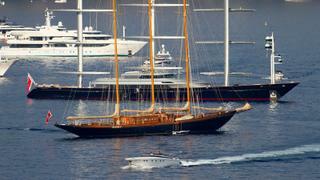 Here are some of the best pictures of the grand arrivals on the French Riviera, photographed 24-26 September. 1. 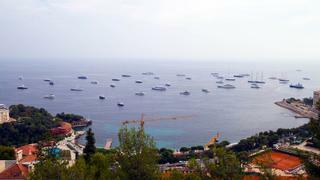 The first arrivals Photographed here is a scattering of stunning superyachts, ready and waiting in Monaco for the show to get underway. 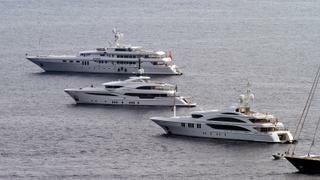 We've named a few favourites, from left to right: TV, T6, Sea Force One, Double Trouble, Burkut, Lionheart, Lady Ann Magee, Lady Marina, My Way, Jetsetter, Endeavour II, La Sultana, Africa, Apogee, Nerissa, Andreas L, Mia K, O'Mega, Okto, Double Down, Maltese Falcon, Force Blue, Secret Life and Aurora. 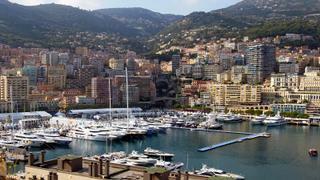 The prolific Monaco Yacht Show kicks off on September 27 and the superyachts are flocking to be part of the big event. 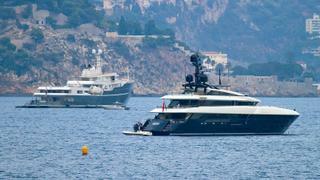 Here are some of the best pictures of the grand arrivals on the French Riviera, photographed 24-26 September. TV, T6, Sea Force One, Double Trouble, Burkut, Lionheart, Lady Ann Magee, Lady Marina, My Way, Jetsetter, Endeavour II, La Sultana, Africa, Apogee, Nerissa, Andreas L, Mia K, O'Mega, Okto, Double Down, Maltese Falcon, Force Blue, Secret Life and Aurora. 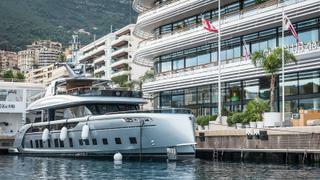 Launched earlier this month, the 35 metre Dynamiq superyacht GTT 115 arrived in Monaco from Viareggo just in time for the Monaco Yacht Show. Boasting distinctive interior and exterior design by Studio F.A. Porsche, she's bound to catch a few eyes at the event. Having arrived in Monaco from Genoa on September 26, the 110 metre superyacht Jubilee cuts a striking silhouette in the cool grey waters. Delivered earlier this year by Oceanco, she is the largest superyacht built in The Nertherlands to date. With naval architecture by Azure, exteriors by Igor Lobanov and interiors by Sam Sorgiovanni, she can sleep up to 30 guests in 15 cabins and boasts a a helipad, swimming pool with built-in aquarium and beach club. Having arrived in Monaco from Genoa on September 26, the 110 metre superyacht Jubilee cuts a striking silhouette in the cool grey waters. Delivered earlier this year by Oceanco, she is the largest superyacht built in The Nertherlands to date. With naval architecture by Azure, exteriors by Igor Lobanov and interiors by Sam Sorgiovanni, she can sleep up to 30 guests in 15 cabins and boasts a a helipad, swimming pool with built-in aquarium and beach club. In this picture we can see the refitted Lady A alongside the stars of the show this year, Areti (left) and Cloud 9 (right) with Chopi Chopi behind her. Arriving from Mandelieu-la-Napoule on September 26, the 55.17 metre Nishii Zosen-Sterling superyacht Lady A was built in Japan and refitted last year by Burgess Marine. She boasts Jon Bannenburg exteriors and interiors, she can sleep up to 12 guests in six cabins, which includes a master stateroom. The 85 metre Lürssen superyacht Areti also arrived on September 26, and was delivered earlier this year with Winch Design exterior and interior styling. Notably one of the coolest new superyachts on 2017 so far, charter yacht Cloud 9 was delivered by CRN with Winch Design interiors. 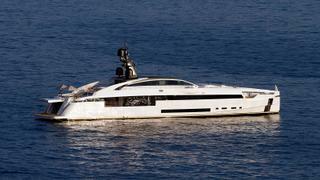 Another CRN, 80 metre Chopi Chopi was delivered in 2013. In this picture we can see the refitted Lady A alongside the stars of the show this year, Areti (left) and Cloud 9 (right) with Chopi Chopi behind her. Arriving from Mandelieu-la-Napoule on September 26, the 55.17 metre Nishii Zosen-Sterling superyacht Lady A was built in Japan and refitted last year by Burgess Marine. She boasts Jon Bannenburg exteriors and interiors, she can sleep up to 12 guests in six cabins, which includes a master stateroom. The 85 metre Lürssen superyacht Areti also arrived on September 26, and was delivered earlier this year with Winch Design exterior and interior styling. Notably one of the coolest new superyachts on 2017 so far, charter yacht Cloud 9 was delivered by CRN with Winch Design interiors. Another CRN, 80 metre Chopi Chopi was delivered in 2013. The new 48.5 metre Rossinavi superyacht N2H (pictured right) was launched in April and has been cruising the French Riviera throughout September. She was styled inside and out by Team For Design. Arriving on September 26, 77.4 metre expedition yacht Legend is currently listed for sale and available for charter. Delivered by IHC Verschure in 1974, she was completely refitted in 2016 by Icon Yachts. The new 48.5 metre Rossinavi superyacht N2H (pictured right) was launched in April and has been cruising the French Riviera throughout September. She was styled inside and out by Team For Design. Arriving on September 26, 77.4 metre expedition yacht Legend is currently listed for sale and available for charter. Delivered by IHC Verschure in 1974, she was completely refitted in 2016 by Icon Yachts. Launched in April 2017, the 49 metre Rossinavi superyacht Aurora made her way over to Monaco from Viareggio on September 24. Taken in the evening of September 24, this photograph shows 52 metre Sanlorenzo Seven Sins, 47 metre Turquoise Yachts Razan, 55 metre Amels yacht Lili and 40.25 metre Cantieri Navali Chioggia explorer yacht Genesia already in the harbour ready and waiting for things to get underway. Taken in the evening of September 24, this photograph shows 52 metre SanlorenzoSeven Sins, 47 metre Turquoise YachtsRazan, 55 metre Amels yacht Lili and 40.25 metre Cantieri Navali Chioggia explorer yacht Genesia already in the harbour ready and waiting for things to get underway. Delivered by Benetti in recent months, the 67 metre custom yacht Seasense arrived in Monaco on September 24 from St Tropez. Turning heads in every port, the iconic 88 metre Perini Navi luxury yacht Maltese Falcon arrived in Monaco on September 18 from Greece. Delivered in 2006, she is also available for charter. Dwarfed by Maltese Falcon, 65.3 metre Creole – also available for charter – was originally delivered in 1927 by Camper & Nicholsons. Turning heads in every port, the iconic 88 metre Perini Navi luxury yacht Maltese Falcon arrived in Monaco on September 18 from Greece. Delivered in 2006, she is also available for charter. Dwarfed by Maltese Falcon, 65.3 metre Creole – also available for charter – was originally delivered in 1927 by Camper & Nicholsons. This year, approximately 125 superyachts will be in attendance and visitors can see 45 new launches alongside some of the largest yachts in the world, a variety of new tenders and dayboats, must-see tech and toy brands and top interior design brands. 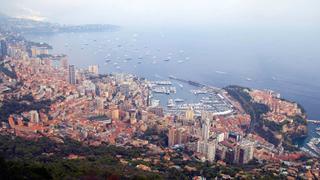 New Secret arrived in Monaco from Sanremo on September 26. Delivered earlier this year by Amels, the 74 meter superyacht boasts exteriors by Tim Heywood and interiors by Winch Design. 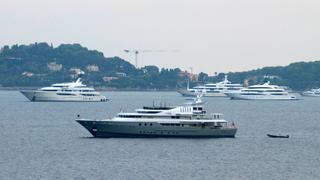 Codecasa-built superyacht Apogee arrived in Monaco on September 24 from Genoa. Delivered in 2003, she is available for charter and listed for sale. Launched in summer this year by Istanbul-based Bilgin Yachts, 47.5 metre Nerissa arrived on September 25 from Turkey. The 60 metre Andreas L arrived in Monaco on September 20 from Bonifaco – she was delivered in 2008 by Benetti. 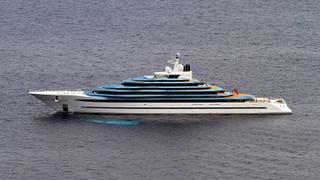 Codecasa-built superyacht Apogee arrived in Monaco on September 24 from Genoa. Delivered in 2003, she is available for charter and listed for sale. 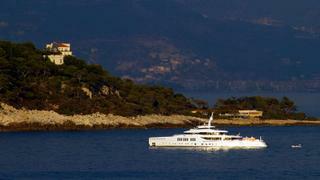 Launched in summer this year by Istanbul-based Bilgin Yachts, 47.5 metre Nerissa arrived on September 25 from Turkey. 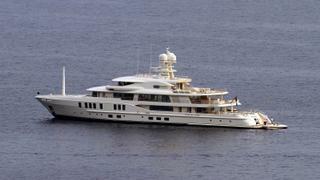 The 60 metre Andreas L arrived in Monaco on September 20 from Bonifaco – she was delivered in 2008 by Benetti. As the yachting industry turns its focus to this world-famous event, everybody is looking forward to the myriad of launches and unveilings that will be taking place over the next few days.